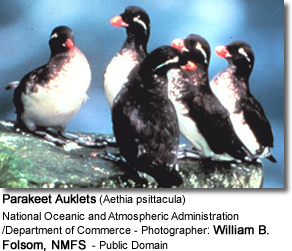 The Parakeet Auklet (Aethia psittacula) is a small seabird of the North Pacific. It used to be placed on its own in the genus Cyclorrhynchus (Kaup, 1829) but recent morphological and genetic evidence suggest it should be placed in the genus Aethia. It is associated with the boreal waters of Alaska and Kamchatka and Siberia. 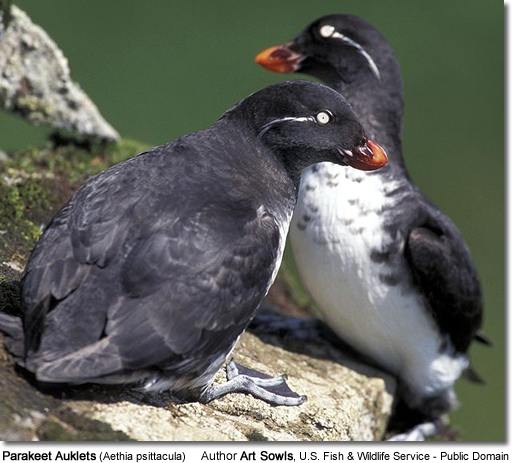 It breeds on the cliffs, slopes and boulder fields of offshore islands, generally moving south during the winter.